U.N. Report: The Catastrophic Toll From The Collapse Of Mining Waste Dams : Goats and Soda A report by the United Nations Environmental Programme offers recommendations to stop the failure of dams holding mine waste. Will governments and industry leaders sign on? 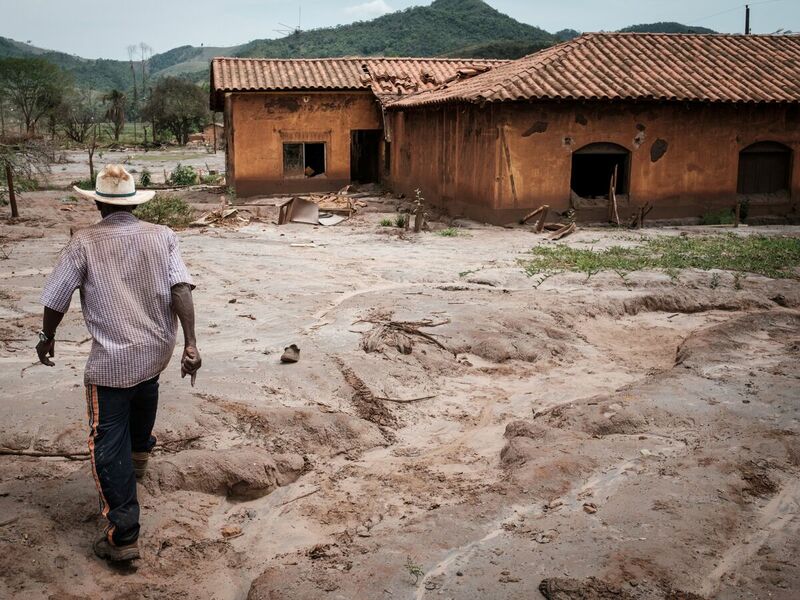 Brazilian 76-year-old farmer Jose Pascual walks through a devastated area in Paracatu de Baixo village on October 2016, one year after a mine waste flood destroyed the town. The village was ruined in 2015 by a flood following the collapse of Brazilian mining company Samarco's waste reservoir, killing 19 people. Some of the worst mining disasters do not happen in mines. They take place at dams. After minerals are extracted from mines, there are waste materials — including sand, rock and chemicals. They're known as "tailings" and are permanently stored in dams constructed of earth, rock-fill or concrete. But the dams can fail — from chemical erosion caused by the tailings and from disasters like floods and earthquakes. And the toll can be devastating. That is the message in a report by the United Nations Environmental Programme (UNEP) released in November. It is the first time the U.N. has documented the widespread destruction caused by these dam failures. In 2014, for example, a Canadian dam built on a weak foundation broke, spilling billions of gallons of mine waste into a nearby creek. The torrent of waste and water washed away trees and contaminated nearby lakes. Lingering environmental effects from the Mount Polley Disaster, as it is known, are still felt to this day. In 2015, a similar event occurred in Brazil. Another mine tailings dam failed, spilling — again — billions of gallons of waste. The spill turned into a rushing mud flow that inundated parts of a village, pulling cars downstream and destroying hundreds of homes. Nineteen people died as a result. An investigation found the dam's collapse was caused by flaws in its design and drainage. These spills were not isolated incidents, according to the 70-page report, which documents mining waste failures from all over the world. It also offers recommendations for government and mining industry leaders to help prevent such disasters in the future. But it is unclear if its recommendations will lead to change. The failures in the report include: a 1985 spill in Italy that caused the death of 268 people, a 1996 spill in the Philippines that "destroyed" the Boac River, a spill in Romania from 2000 named the "worst environmental disaster in Europe since Chernobyl" as well as the Canadian and Brazilian incidents. "The ultimate goal is to reduce the catastrophic failures of mine tailings dams," says Oli Brown, coordinator of extractives work for UNEP. The report refers to a 2001 study that found the technical knowledge to build and maintain secure tailings storage facilities exists. But the report says "an inadequate commitment to safe storage combined with poor management was the cause of most failures." 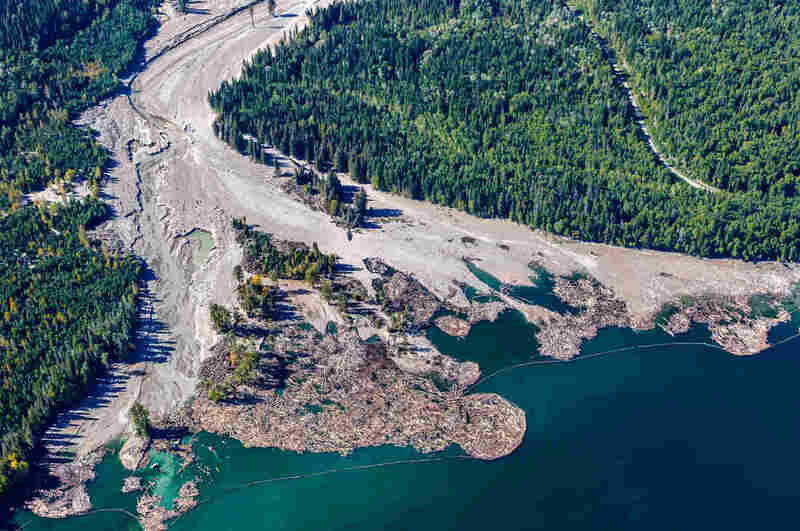 With the Mount Polley disaster, for example, the report notes the British Columbia Ministry of Energy, Mines & Petroleum Resources — the regulatory body overseeing mining in that province — did not ensure the dam was built or operated according to approved designs. The UNEP makes two main recommendations. First: Governments and industry should make environmental and human safety a priority. The report claims that is not always the case. Among the proposals; expand regulations and levy financial and criminal sanctions for noncompliance. The second recommendation is to establish an international forum with industry leaders and government representatives with the aim of strengthening mine waste regulation. But the recommendations made in the report are just that: recommendations. It is up to host governments and the mining industry to decide if they want to implement them. And as the report points out, governments have, in the past, responded in significantly different ways. After Brazil's disaster, which killed 19 people, authorities charged 22 people, among them executives of the mine's parent companies, with homicide. Talks are still ongoing for a settlement claim for monetary compensation between the parent companies and Brazilian authorities. In Canada, although there were no deaths, the impact was still severe. "There's significant impact on the indigenous peoples that are depending on that land and those waters," says Ugo Lapointe, Canadian program coordinator for MiningWatch Canada, a watchdog organization that supports the report's recommendations. "The damages from that spill are pretty extensive. It basically destroyed a 10-kilometer stretch of a forest and a creek," Lapointe adds. As yet, no one has been charged and no criminal sanctions have been placed on those responsible for the spill in British Columbia. But indigenous people and nongovernmental organizations have filed civil cases against Imperial Metals, the mining company that owns the dam. The Mining Association of Canada (MAC), the self-proclaimed "national voice of the Canadian mining industry" did not respond to requests from NPR for comment on the UNEP recommendations, instead sending links to the association's documents. Imperial Metals has been a member of MAC since 2012. In a statement to NPR, a spokesperson from the British Columbia Ministry of Energy, Mines & Petroleum Resources said there have been "significant changes to how mining is done in British Columbia including new policies, additional resources and funding to improve permitting processes and strengthen compliance and enforcement." The ministry did not respond to further questions on the UNEP recommendations. This kind of inconsistency is why Lapointe argues that an international approach to tackling mine spills may be the best approach. "The consequences on the civil side and criminal side are very weak around the world," Lapointe says. "So if the corporate actors are seeing that they can get away without much consequences after these spills, we believe that it will keep happening. But if they know there can be serious consequences, that can help change the situation." But that's beyond the power of the United Nations. "It's not for the U.N. to dictate the sanctions that individual countries should put on private sector companies within their own borders," Brown from UNEP says. "And we would be really careful about saying that a country should do X, Y or Z sanction. It is for that country to set up the regulatory environment." There have been other initiatives to improve mine waste management, including an extensive 2001 report by the International Commission on Large Dams (ICOLD), published in conjunction with UNEP. However, the newest report says that "major failures are still occurring and are predicted to continue." The U.N. is hosting the United Nations Environment Assembly from December 4 through 6 in Nairobi, Kenya. This year's theme centers on pollution; Brown says the mine tailings report will be showcased. It is his hope the recommendations will be taken into consideration by the governments. Lapointe is just as hopeful... but also cautious. "The Nairobi assembly — maybe they're going to showcase the report, but it's not going to be enough," Lapointe says. "It's like any regulatory changes on a global scale: it takes lots of effort and lots of attention to push it. And we see it right now in the climate change debate, for example. But you still need to do it, you still need to push for it."